With a population of over 16 million in an area of only 38.55 square kilometers, Manila is the most densely populated city in the world. 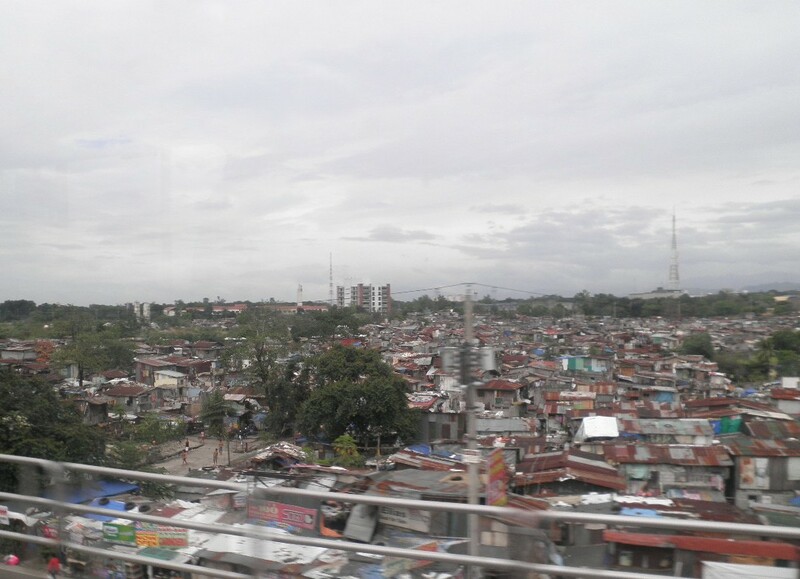 The greater urban area of Metro Manila is the fifth-most populous area in the world with an estimated population of nearly 21 million people. I feel like I rubbed shoulders with a pretty good percentage of them on the MRT this week. According to the United Nations, the percentage of urban dwellers living in slums decreased from 47 percent to 37 percent in the developing world between 1990 and 2005. However, due to population growth, and the recent rise especially in urban populations, the number of slum dwellers is rising again. One billion people worldwide live in slums, the highest concentration of them in Asia, and the figure will likely grow to 2 billion by 2030. 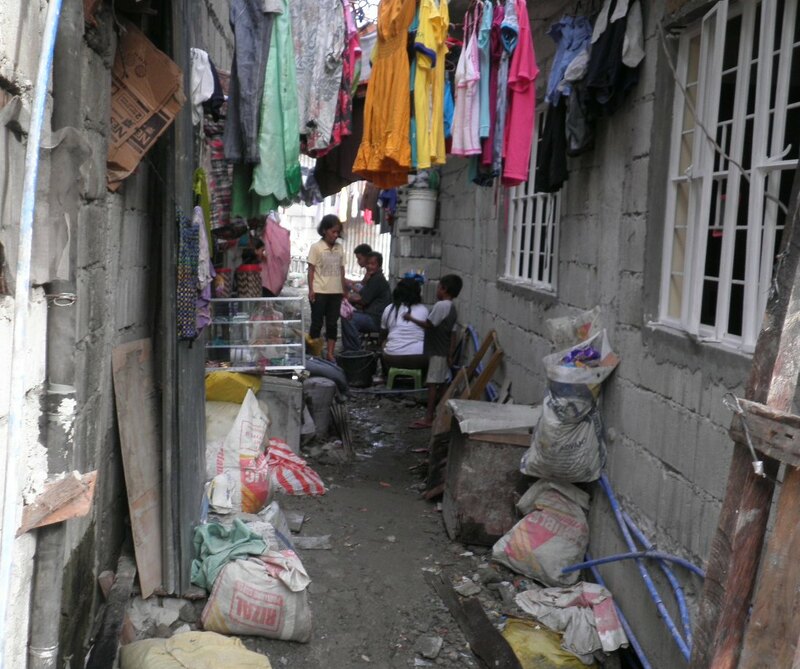 According to a UN-Habitat report, over 20 million people in the Philippines live in slums, and over 11 million of them live in the city of Manila. We spent two afternoons this week visiting with CHE volunteers and families in three different types of slum areas. One area was home for about 500 families who live at the base of a mountain of garbage and make their living by recycling trash from household garbage to electronics for a living, selling the occasional usable goods or stripping broken goods for parts and raw materials. 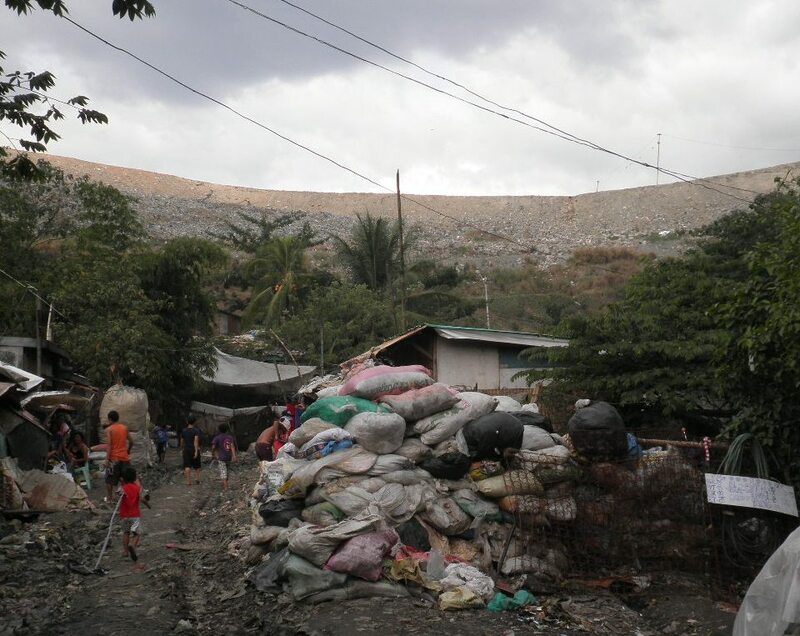 They climb this man-made mountain at 4 a.m. when the city garbage trucks begin to roll in, in order to get first access to goods and food scraps. There is one source of water which is not safe for drinking, no toilets and a ditch flowing through with water that comes from the cleaning of pigs and garbage. 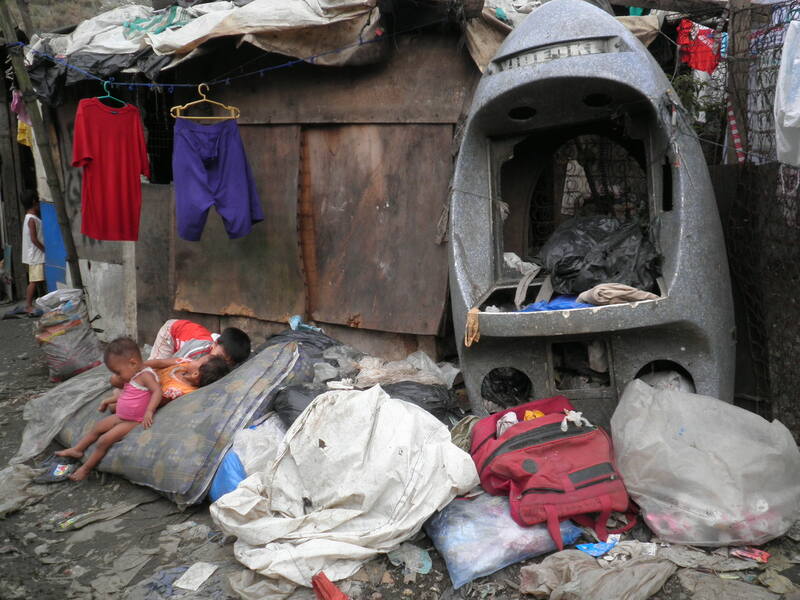 This is gross beyond description or even comprehesion, I know, but that is the reality for millions in Manilla. In another area, about 16,000 people are crowded into semi-permanent, one or two room homes stacked on top of each other in a sunken area which regularly floods with as much as five feet of water when the rains come. In the monsoon season that is a daily occurance. Families on the lowest levels simply moved in with families on the higher levels for the duration. That is life in the slums. We climbed a ladder to visit in a house with two rooms, each about 6 by 8 feet, home to a mother, her six children and newborn granddaughter. As I took this tiny baby girl from the arms of her 17 year old mom, I knew that very likely she would grow up to be the third generation of this family to live in this seemingly hopeless situation. One of the books we were looking at in the training was City of God, City of Satan by Robert Linthicum in which he states “The urban church is not meant to be a shelter, it is meant to be a seminary! All members are to be equipped to effectively confront the structures and forces of their city” The Philippines claims to be the only Christian nation in Asia. More than 86 percent of the population is Roman Catholic, 6 percent belong to various nationalized Christian cults, and another 2 percent belong to well over 100 Protestant denominations. I couldn’t help but wonder how the church can even begin to meet the needs in their areas but I met a number of women who are doing their very best. I finally found the short cut that Chris made for me to your site ( technology and I are like water and oil ) and was found your posting for today. It would appear that I have quite a bit of reading to do to catch up. Chris usually keeps me up-dated with your news now and again but I feel I need to follow myself more closely now. I was just checking my mail before heading to my cosy bed but somehow it will not feel as cosy tonight. Pictures do say a thousand words and I thank you for posting these. Can you tell me what the grey thing is in the second picture and is that someone inside? My eyes are weary and I lost my glasses yesterday. They are in the house somewhere hiding on me. As always you are missed so much and at times I am find myself being selfish wishing you were here. It surely helps my heart knowing that God took you and uses you where you are. I found your picture that we keep on the fridge yesterday ( still unpacking – perhaps I should use a more updated one ) and as soon as I get to the magnets we will be able to see you each day. Nice to hear from you Laura- we appreciate your prayers and encouragement so much. The gray thing in the picture is an old Karaoke machine without the electronics which I guess they pulled out of the garbage and found some use for in their house. You need to do what Steve does – he just keeps buying the $5 magnifying glasses so that he has so many that he can always find some glasses laying around.